President Hu Jintao shook hands with AIDS patients in a Beijing hospital yesterday afternoon, encouraging them to "persist in medical treatment and remain confident for an early recovery." Wearing a special red silk ribbon which symbolizes love and care for AIDS patients, Hu visited the Beijing You'an Hospital on the eve of the World AIDS Day observed today. Amidst his visit to two of the hospital's special wards, which house 14 AIDS patients, Hu reached out for handshakes with an AIDS patient inside and had chatted with him. This was the second time in a year that top Chinese leaders shook hands and spoke with AIDS patients. 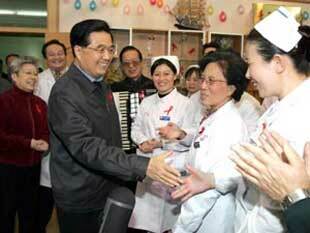 On the World AIDS Day last year, Premier Wen Jiabao visited AIDS patients at a Beijing hospital. Wen had said the HIV/AIDS prevention and control situation in China is still quite serious and asked government agencies at various levels to do a better job in fighting the disease. "Tomorrow is the World AIDS day. I and other officials have come to see you," Hu told the patient, before asking for details about his treatment and his family. "It is very unfortunate for you to contract the disease, but the Party, the government and society will truly care about you and will help you," Hu said. "I hope you will remain confident and work with your doctors for an early recovery." In another room, Hu wrote "Wish you recover at an early date!" on a piece of paper for another patient. Hu was accompanied by Wu Yi, vice-premier in charge of China's AIDS control and prevention work, and Beijing municipal officials. During his stay, Hu also visited an exhibition on China's AIDS control and prevention. As China's top leader, Hu has attached great importance to the country's AIDS prevention efforts. Sources said Hu expressed the wish to personally visit AIDS patients shortly after his return from his Latin American tour last week. Last week while attending the 12th Economic Leaders' Summit of the Asia-Pacific Economic Co-operation (APEC) in Santiago, Chile, Hu expressed his concern that the affect of swift spread of AIDS on economic and social development should not be underestimated. "China supports co-operation among APEC members in epidemic control and prevention, which will help APEC members improve their public health systems through information exchanges and technical co-operation," Hu addressed the meeting.